In February 2017, an excavation was conducted in the ancient village of ʽEn Gedi (License No. B-448/2017; map ref. 2373/5965; Fig. 1). The excavation, on behalf of the Institute of Archaeology of the Hebrew University of Jerusalem, was directed by G. Hadas and O. Peleg-Barkat, with the assistance of R. Merhav (administration), D. Porotsky (plans), A. de Vincenz (ceramics) and the participation of volunteers from Israel and abroad, mostly veterans of the ʽEn Gedi expedition, students from the Institute of Archaeology of the Hebrew University, instructors from the ʽEn Gedi Field School, students of the Melahin Ha-Arez preparatory program ʽEn Gedi and inspectors of the ʽEn Gedi Nature Reserve. The excavation was funded by donations from foundations and individuals abroad and was assisted by the Nature and Parks Authority. The purpose of the excavation was to connect the two parts of the Byzantine village excavated in 1996–2002 by Y. Hirschfeld, in the area north of the village’s ancient synagogue, to create a single heritage site (Hirschfeld 2007). Until January 2016, a large water pipe ran from north to south through Hirschfeld’s excavation area, thereby preventing any possibility of a continuous excavation through the area. The pipe was removed and excavation began in the area where it had been situated (Fig. 2). As in the rest of the flat area of the oasis, here too, ground preparations performed in the 1950s damaged the archaeological remains that were close to the surface. Consequently, none of the buildings from the Mamluk period survived, and all that was preserved from that time was a burnt destruction layer exposed several centimeters above the burnt destruction layer of the Byzantine phase (Figs. 3, 4). Below the burnt Mamluk layer, which as stated did not include any architectural remains, were the remains of the village’s houses from the Byzantine period. The bottom part of these houses was built of fieldstones, mud mortar and plaster, whereas the upper part of their walls and several of the inner walls were constructed of sun-dried mudbricks. A new section of an alley was exposed (Fig. 5), the continuation to the east and north of the ‘Drainage Channel Alley’ uncovered in 2016, which led to the village synagogue. The new section of the alley was connected in the north to the ‘Synagogue Alley’ that Hirschfeld had excavated. Several rooms were exposed north of the ‘Drainage Channel Alley’. The shape of the ‘Southern Room’ (L7010) resembled a right-angled trapezoid (5.0 × 5.5 m), and its floor consisted of several layers of fine yellowish clay. It became clear that the eastern wall (W700; width c. 0.7–0.8 m, preserved height 0.4–0.5 m) was built atop an ancient wall (W700A; width 1.2 m), perhaps from the Early Roman period, whose top was exposed in the floor of the room. 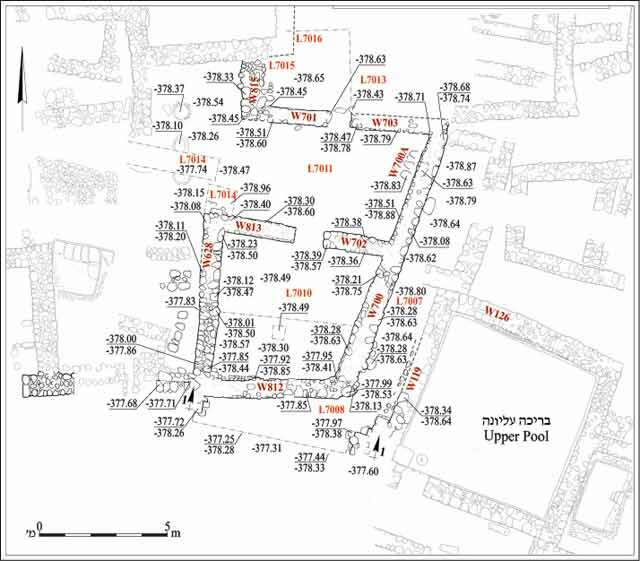 Running the length of the southern wall (W812) that was exposed and the eastern wall (W700), which was c. 2 m west of the ‘Upper Pool’ (W119), was an alley extending north—the continuation of the ‘Drainage Channel Alley’—excavated in previous seasons. This alley connects to the alley that Hirschfeld exposed east of the pipe (Hirschfeld 2007:75, Fig. 110). The ‘Northern Room’ (L7011) had two openings, in the south and the north. The southern opening (width c. 1.1 m) led to Room 7010, and the northern opening was only partly exposed. The eastern part of Room 7011 was exposed, revealing that the room was T-shaped. The top of the T, which faced west (length east–west c. 9 m, max. 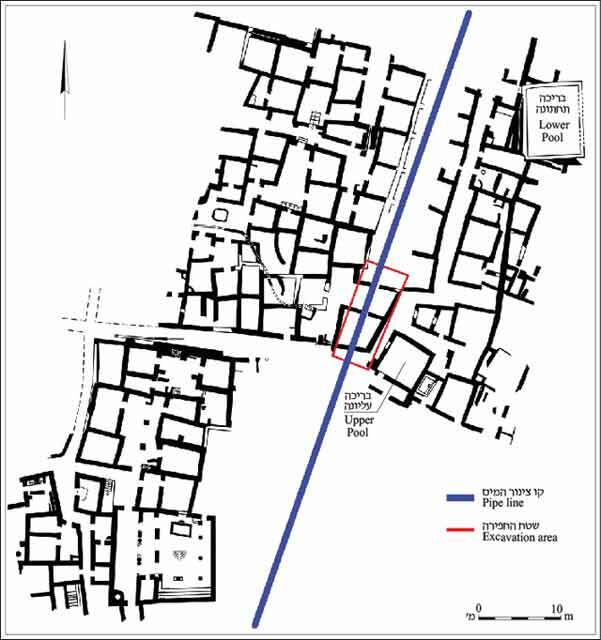 width 6 m), had been excavated by Hirschfeld, who referred to it as the ‘Industry Room’ and as the ‘Room with Three Tabuns’ (L3420, L3523; Hirschfeld 2007:71). A balk remained on top of the middle tabun inside the room. While cleaning the area near the balk, a hard, thick layer of tabun ash was revealed. A probe was excavated to a depth of 0.8 m below the floor next to the corner of the southern wall (W813, L7012), exposing the foundation course of the room’s western wall (W628). Four more layers of tabun ash were discerned in the sections descending the entire depth of the probe. A room (L7013) was partly exposed north of the ‘Northern Wall’, at the elevation of the top of the southern and western walls. The area was replete with stone and brick collapse, especially in the western and eastern corners. A few coins, pottery sherds and glass fragments were collected during the excavation and several chunks of charred wood and animal bones were also gathered. Interestingly, most coins were collected in Room 7010 and only one coin was found in Room 7011. 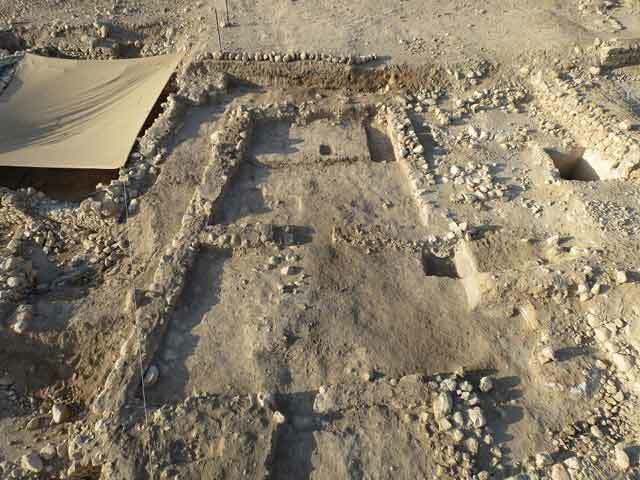 The nature of the architectural finds in this season’s excavation differs from that of the residential buildings that were exposed during previous seasons in the village (Hadas 2013). The Byzantine walls that were revealed were preserved to a very low height (only 0.2–0.5 m) and the Mamluk destruction layer above them was very close to the Byzantine floors. No burnt palm trunks were discovered on the floors, nor were there any whole or smashed pottery vessels or iron nails. No installations were found during this season that characterize the residential buildings, such as cooking ovens and mortars. This season, the eastern continuation of the ‘Drainage Channel Alley’ was uncovered. The route the alley followed from the northeastern part of the village to the synagogue, as Hirschfeld suggested (2007:73), is now clear. The re-exposure of the ‘Industry Room’, the nature of which is still unclear, was also begun. The removal of the balk above the middle tabun in the western part of Room 7011 will continue next season, as well as the exposure of the remains north of the area, which were excavated this season. Hadas G. 2013. ʽEn Gedi. HA-ESI 125. Hirschfeld Y. 2007. 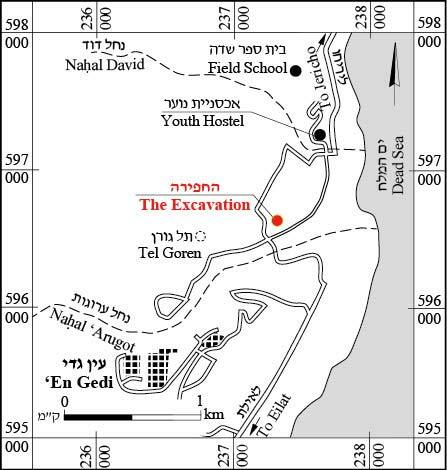 En-Gedi Excavations II: Final Report (1996–2002). Jerusalem. 2. The Byzantine village and the excavation area, plan. 3. Section L–L: in the center is a thick black burnt layer from the Mamluk period, and inside this layer, evidence of later ground preparation. 4. The excavation area; in the background, Section 1–1, looking south. 5. The excavation area, plan.